I will preface this post with the fact that I get about ten to twenty phone calls and/or emails each and every week from my clients about this topic alone. Personally, I am grateful for their trust and I deeply appreciate the opportunity to help them. PHISHING is defined by wikipedia as: the fraudulent attempt to obtain sensitive information such as usernames, passwords and credit card details by disguising as a trustworthy entity in an electronic communication. Typically carried out by email spoofing or instant messaging, it often directs users to enter personal information at a fake website, the look and feel of which are identical to the legitimate site. Turns out, the email was indeed legitimate, but kudos to my client for asking first because he was in doubt! My philosophy has always been... "Better Safe Than Sorry!" Turns out though... this email was legit too! Most of the emails or phone calls I get about suspicious emails aren't always legitimate though, they are usually in fact spam, phishing, or emails with malicious intent and again, I am happy to review questionable items that clients send to me. 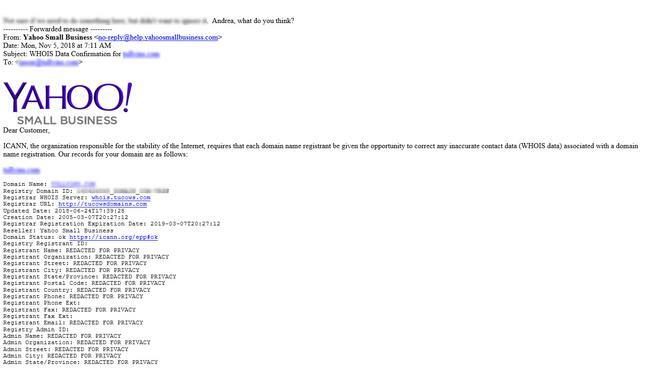 When a client forwards me an email that they are questioning, I ALWAYS employ the "mouseover link" technique to help determine if it is in fact a phishing email, scam email, or legitimate email. But, just because they match doesn't necessarily guarantee they are safe to click on. In this case, yes - they are safe to click on. But keep reading... there are some clever scams out there and we don't want you to get caught up their deceitful net. 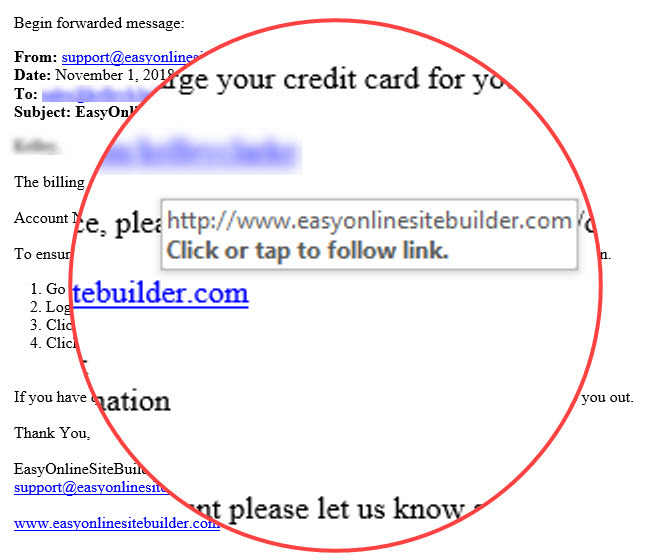 More information on how to quickly discern if a link in an email is legit. Here is another example to help you quickly determine if a link in an email is "OK" to click on - hover your mouse over the link and look at the little popup that appears. Does the URL (website address or link address) match exactly? 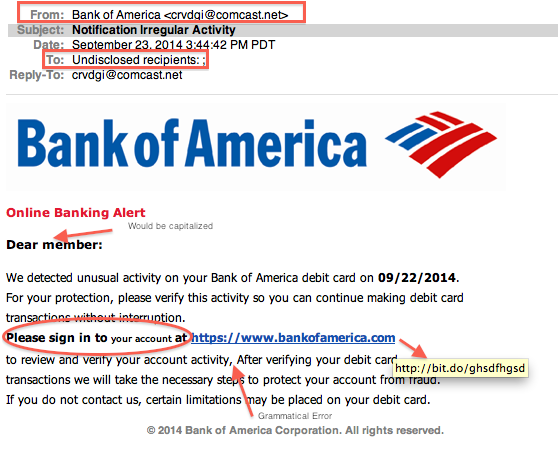 Check out the image below (by Brave River) - it shows a link that is displayed in the email as "https://www.bankofamerica.com" - but when you hover over that link in the email, it shows a VERY DIFFERENT website address of "http://bit.do/ghsdfhgsd" - clearly NOT a legitimate link! Another example to help you figure out if a link is OK to click on or not. Notice that the word "paypal" is included, but it does not immediately precede the dot com part of the website address. That is an immediate RED FLAG and DO NOT click on the link! If the link had said the exact opposite... something like http://www.fjdas.paypal.com or even the secure version of that link which would read https://www.fjdas.paypal.com - then I "might" be more inclined to click on the link or at the very least, my trust meter would go up a tiny bit. There are free services available online, like CheckShortURL that will show you a short link's true destination. Some link expanders will even go the extra distance and let you know if the link you submitted is on a list of known "bad sites". Below is a video from Tyler at Specialized Computer Solutions outlining several best practices for maintaining email security and identifying scam and phishing emails. The video is about five minutes long and it covers the essentials of how to identify phishing and scam emails. Another excellent article about "How To Check If A Link Is Safe To Click" was posted by Andreas Heifsel over at Teamviewer. The TEDtalk video below was so funny that I just had to share it! It is also educational - but mostly funny! Purely for entertainment purposes - a TEDtalk on what happens when you reply to spam email with James Veitch. 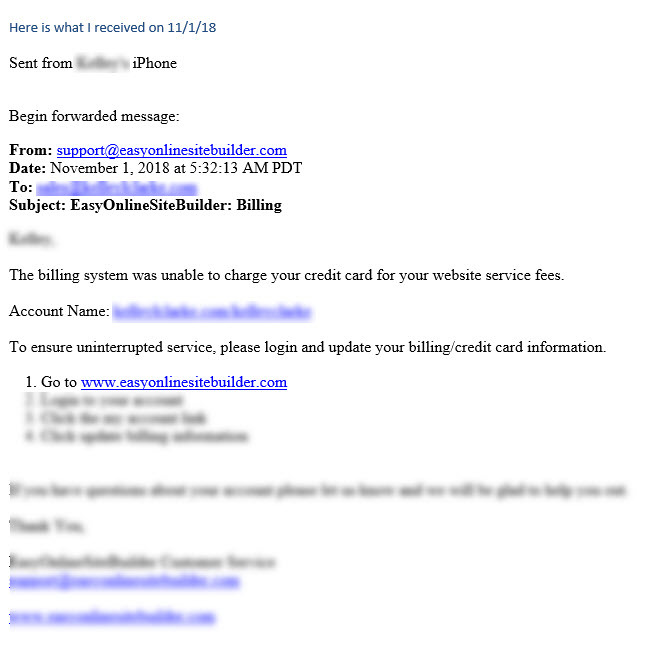 I am truly hopeful that the information provided above has been helpful and has added not only value, but provided some actionable steps that you can take to further protect yourself and your business from malicious emails. Which bad experiences have you had when clicking on links that you were not sure about? Would these tips have been helpful to you and your business? Comment below... thank you!